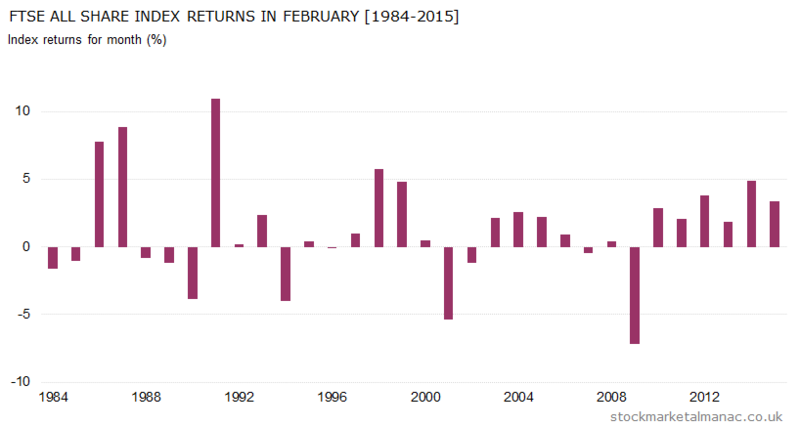 Since 1970 the average month return of the FTSE All-Share Index in February has been 1.6%, with the month seeing positive returns in 64% of years. But a glance at the accompanying chart will show quite how strong the market has been in February in recent years. Since 2009 the market has been up every February, and since 1994 market has only seen significant negative returns in three years. There’s no obvious reason why the market has been so strong in recent years in this month; although one possible explication might be that, also in recent years, shares have been weak in January and so they experience a bounce back rally in February. On the international front, February is one of the four months in the year that the FTSE 100 Index has historically out-performed the S&P 500 Index. Since 1999 the UK index has underperformed the US index in Fenruary in only three years. Although the out-performance is somewhat attenuated once currency is taken into account as GBPUSD is historically weak in February. Aside from shares historically this has been a strong month for gold and silver. February is currently on something of a roll. Since 2009 the market has been up every year in February. This is a far better record than any other month of the year. And, further, since 1994 the market has only seen significant negative returns in three years. 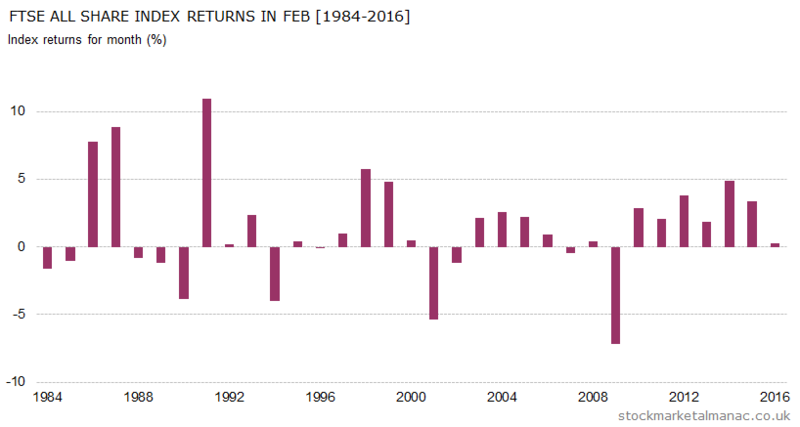 Since 1970 the average return of the FTSE All-Share Index in February has been 1.6%, with the month seeing positive returns in 63% of years. There’s no obvious reason why the market has been so strong in recent years in this month; although one possible explication might be that, also in recent years, shares have been weak in January and so they experience a bounce back rally in February. In an average February the market tends to rise for the first two-and-a-half weeks and then drifts lower for the rest of the month. A feature of February is that, with January, it is the best month for mid-cap stocks relative to the large caps. Since 2000 on average the FTSE 250 Index has out-performed the FTSE 100 Index by 1.7 percentage points in this month. On the international front, February is one of the four months in the year that the FTSE 100 Index has historically out-performed the S&P 500 Index, although the out-performance is attenuated once currency is taken into account as GBPUSD is historically weak in February. The strong sectors in February tend to be Chemicals, Construction & Materials, General Retailers, Household Goods, Mining, and Oil Equipment; while the weak sectors are Electronic & Electrical Equipment, Financial Services, and Technology Hardware & Equipment. And it’s a busy month for analysts as there are more FTSE 100 results announced during the month than any other ­ 39 companies announce their prelims in February (as do 56 FTSE 250 companies). Dates to note this February are: 4 Feb ­ MPC interest rate announcement at 12 noon, 5 Feb ­ US Nonfarm payroll report, and 16 Feb ­ President’s Day (when the will be NYSE closed). The 15th of the month will see the 10th anniversary of the controversial flotation of QinetiQ. And, finally, 8 February is the Chinese New Year; this new year will be the year of the monkey. Since 1950 the average return in monkey years has been 7.3%. 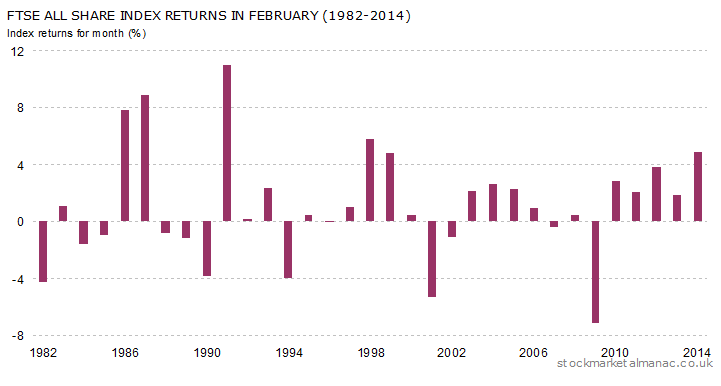 Since 1984, the FTSE 100 Index has risen on average 0.56% on the first trading day of February. The index has had a positive return on this day in 58% of years since 1984. Since 2000, the performance has been even stronger on the February FTD, with an average return of 0.80% on the day, and with positive returns seen in 75% of years (making it the second strongest month FTD of the year). 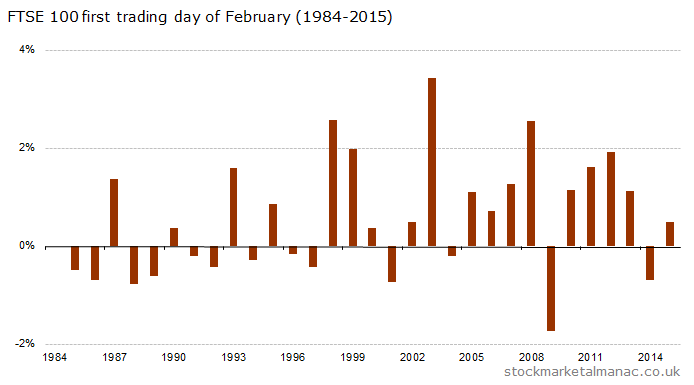 February is the third strongest month of the year; but it hasn’t always been so strong, just six years ago it was ranked ninth of all months. In fact the market has only fallen five times in February in the last 20 years – and, of those five down years, only twice (2001 and 2009) were the falls significant, both in the wake of recent market crashes. As can be seen in the accompanying chart, currently the stock market in February is on a five-year winning streak. 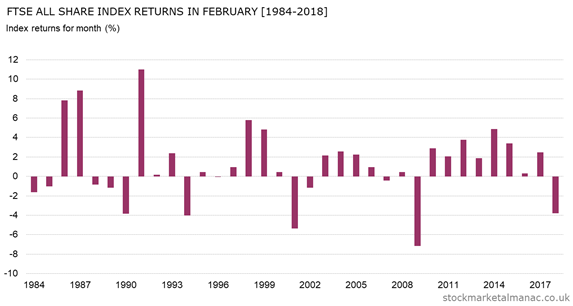 Over the last 30 years the market has risen in February in 60% of all years, with an average return of 1.1% – a record only beaten by the months of April and December. This month is one of the four months in the year that the FTSE 100 Index has historically out-performed the S&P 500 Index, although the out-performance is attenuated once currency is taken into account as GBPUSD is historically weak in February. The following FTSE 350 shares have performed well in February over the last ten years: Bunzl, Croda International, Electra Private Equity, Fidessa Group, and Jardine Lloyd Thompson Group; the shares of these Electra Private Equity and Jardine Lloyd Thompson have risen in every February for the past ten years. The shares that don’t seem to like February are: AstraZeneca, Carnival and Vodafone. It’s a quiet month on the economics front, there will be the MPC interest rate announcement on the 5th and US non-farm payrolls on the 6th. And then the 19th of the month will see the start of the Chinese New Year; this will be the year of the sheep (or ram), which is the eighth sign of the 12-year cycle of animals of the Chinese Zodiac. And the significance of this for the stock market is..? Well, since 1950 the average annual market return has been 17.9% in the year of the sheep – the best year of the Chinese zodiac for shares! As explained in the 2014 edition of the Almanac the LTDs of months used to be stronger than average, but in recent years they have been weak. 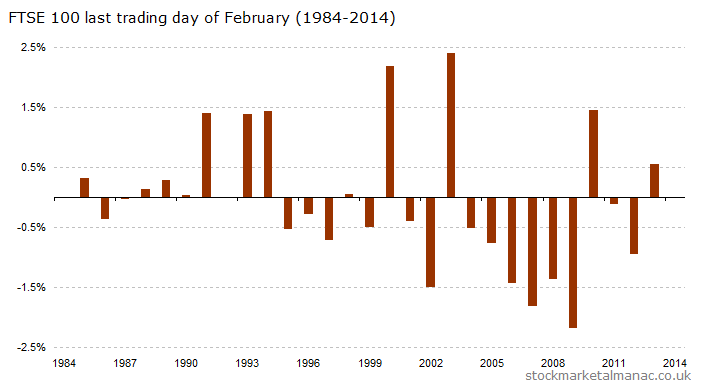 This can clearly be seen in the case of February from the chart below. 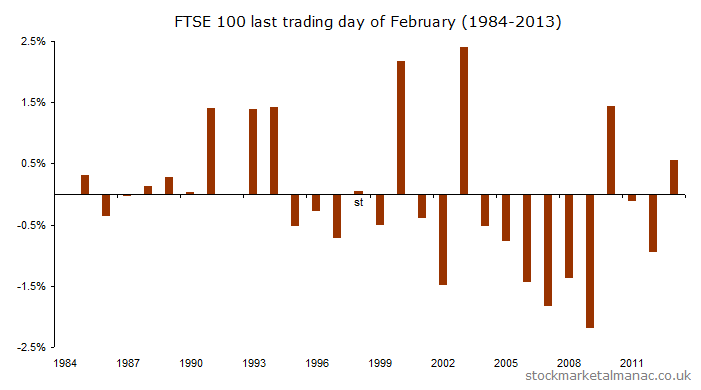 From 1984 to 1994 the FTSE 100 only fell twice on the last trading of February; but in the last ten years the index has only risen twice on the February LTD.